I love the idea of making pickles. For me, pickling conjures up visions of charming country kitchens, steaming pots, banging screen doors, and faded Liberty print housedresses; row upon row of shiny jars packed with bright, tasty things to spice up the dreary winter ahead. At this time of year especially, that vision of industry, tradition and simplicity has its appeal. Of course, it’s totally a fantasy: despite my attempts at various other incarnations over the years, I am a city girl through and through, completely and happily entrenched in city life, not bound to tradition, and not terribly industrious either – especially when the task at hand involves the kind of repetition that home canning demands. I am also not a fan of making things in bulk, so, much like life in that country kitchen, those rows upon rows of jars would drive me a little crazy after a very short time. And yet – and yet! – the fantasy remains. These two (delicious, bright, and easy) salads are the closest I will come this year, but they will, in my mind’s eye, almost get me there. I should warn you that neither of these salads keeps particularly well over night, so don’t plan for leftovers. Whisk together vinegar and oils in the bottom of a large non-reactive bowl (I use a Pyrex mixing bowl). Add carrots and toss well. Leave 3-4 hours, if you can! 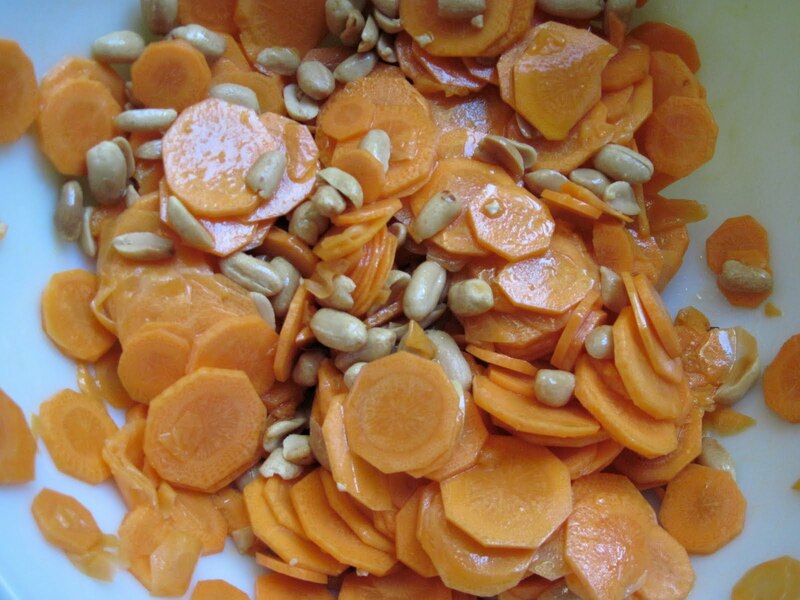 Add peanuts just before serving, and toss well. Place zucchini in a large non-reactive bowl (I use a Pyrex mixing bowl). Add 1/4c of the vinegar, 2 tbsp of the sugar, and 1 tsp of the salt, and toss well. 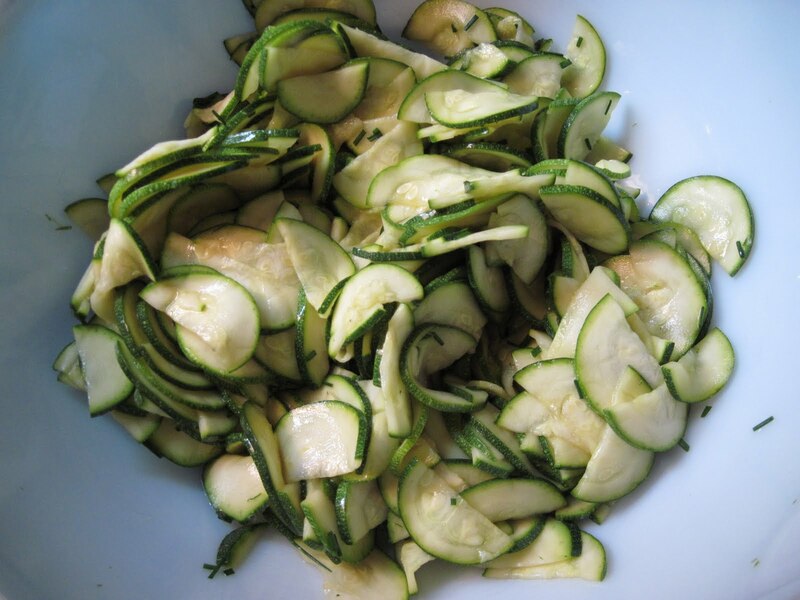 Let sit at least an hour or two, then turn zucchini out into a colander and drain well. Return zucchini to bowl and toss with remaining vinegar, sugar, and salt. Add chives and toss well. Each salad serves 4-6, depending on what else is on offer. Faded housedress optional.